Title design and ident design are like fraternal twins, they don't share the exact same DNA, but they've got a whole lot in common. Which explains our unbridled admiration for ManvsMachine – a motion studio from the UK who have gained a lot of attention and won several awards in recent years for their stunning and highly imaginative brand identities for a number of international tv networks. To name but a few, More4, SyFy, Nickelodeon, 4Seven, Chiller, Kanal 5, and BTVision. Mike Alderson's breakdown of the creative process of ManvsMachine's award-winning More4 Rebrand was one of the highlights of our Playgrounds vs Submarine Channel 2012 event. From Alderson I learnt that sometimes the best ideas require time to settle in and get noticed, because at first glance a great idea may seem too simple, too obvious, or too unusual. We visited Mike and his crew in their "natural habitat" – the ManvsMachine studio in London's Shoreditch district, where we shot this short but sweet profile. NBC Universal commissioned ManvsMachine to create a series of logo idents as part of the Chiller network rebrand. 4seven idents: "We wanted to give the corner-wrap treatment to Britain's most loved intersection: Spaghetti Junction. So we got in a helicopter and made it so." "After winning a competitive pitch, Channel 4 commissioned ManvsMachine to create a new brand identity and on-air look for More4. The package aligns with a re-focussed range of content on the channel." On-screen graphics as part of full channel brand package for new channel 4seven. Opening titles for Disney's animation series Tron: Uprising. "In response to an extremely open brief from Swedish broadcaster Kanal 5, ManvsMachine worked in collaboration with the fine folk at Proud to conceive & create a visually rich and quirky spot, suited to the channel’s eclectic entertainment output." 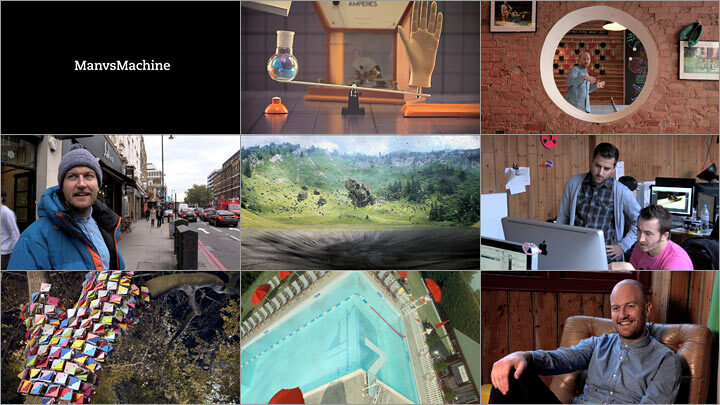 ManvsMachine is a design & motion studio based in London, England. Since opening its doors in early 2007, ManvsMachine has grown into a multi award winning, multinational team of creative specialists directing and producing globally acclaimed branding, commercials, animation, film & print. ManvsMachine's More4 Rebrand was widely published, and for this project the studio won the Gold Lion for Design at Cannes' International Festival of Creativity. In 2012, ManvsMachine presented at the Playgrounds vs Submarine Channel motion design fest in Amsterdam. Camera Gijs Besseling, Director, Editor Carine Bijlsma, Sound Taron Alison, Produced by Submarine Channel, Thanks to Mike Alderson and everyone at ManvsMachine Opening music Jon Hokins "Cerulean"